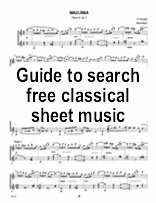 This Guide is the result of my experience of searching free classical sheet music on the net. If you are looking for a specific classical sheetmusic and cant find it in my list or in the list of directories, I'll try to help you, just send me a mail. Hundred of sites offer free classical downloadable sheet music on the net but few are satisfactory.I have selected a few sites where you will find your way easily. All sheetmusic are in the public domain and therefore free and legal. Make sure, you have the right software to view and print the music scores. The Choral Public Domain Library (CPDL) is the largest website devoted exclusively to free choral sheet music. 14 000 public domain choral works most in PDF, finale, or MIDI format. Bach, Brahms, Mozart, Purcell and choral music from earlier composers such as John Bartlet, William Byrd, Josquin, John Dowland, & Thomas Morley. Large collection of classical and contemporary scores for: Piano, Violin, Cello, Viola, Voice, Choral, Organ, Flute, Classical Guitar.PDF or PostScript format.If you do not have a Postcrip printer , use Ghostscript, Ghostview & GSview . The purpose of this web site operated by the Internationale Stiftung Mozarteum in cooperation with the Packard Humanities Institute is to make Wolfgang Amadeus Mozart's musical compositions widely and conveniently accessible to the public, for personal study and for educational and classroom use. Score/Parts for J.S. Bach, BWV 11 (Cantata). Score/Parts for J.S. Bach, BWV 43 (Cantata). Score/Parts for J.S. Bach, BWV 48 (Cantata). Parts for Vivaldi, Op.8 concerti grossi. All JS Bach's Works in PDF and midi. A fantastic non profit site devoted to Berlioz music with free partitions Scorch plug ing needed. Free printable sheet music for guitar, bass guitar, piano, flute, clarinet, violin, alto saxophone, tenor saxophone, trumpet, cello, ukulele and recorder. Easy Piano, classical piano, easy piano lesson scores. Free Christmas sheet music Free sheet music for piano including Auld Lang Syne, Fur Elise, Happy Birthday To You, O Christmas Tree, House Of The Rising Sun and Love Me Tender. Cantate Domino Church and choral music. We hope to provide a growing collection of Anthems and Motets, Services and Settings, Hymns and Psalms, Organ and piano music, and a large selection of carols. Download The Magic Flute (Die Zauberflöte) study score by W.A. Mozart in Ready-to-print PostScript or PDF file formats, or as Type 1 midi karaoke files with or without vocal tracks. Nice collection of high-quality free classical sheet music featuring music from Bach, Beethoven, Byrd, Chopin, Debussy, Mendelssohn, Rachmaninov, Saint-Saens, Satie, Tallis and many more. The contents of 32 of these volumes (approximately 1200 pieces) have been fully scanned and are available on this site. website with free sheet music for piano four hands (one piano) and piano duets (two pianos).Quatre-mains.net aims to build a library of at least 100 free scores for piano four hands. We'll try to publish one new piano score per week. When we've reached number 100, new scores will still be added, but on a less regular basis. We publish easy, intermediate and difficult four hands piano music, and we'll add some studies as well. Violon SheetMusic free downloads of printable violin music in PDF format scanned from public domain editions. classical music, but we also provide music for fiddle players, including Celtic, hymns, and more. Many of the downloads include a piano accompaniment so they can be performed with a pianist. New music is usually added several times per week, so check back regularly. SOFTWARES to view and print the music scores. 3.JPEG / GIF / TIFF / PCX : you can read these files with all free images reader. To save the file, clic on the right buttom of the mouse. And then clic on "save to.." WARNING : The file can be bigger than the A4 format. You must use a software like Word, x-Press, Publisher or PowerPoint... to resize the image as a printer format. These directories sites list free sheetmusic web site. The one I prefer is the first one on the list. You can also consider buying your sheetmusic.. You'll support the artists you love. I recommand Sheet Music Plus.They have over a quarter million titles to choose from.